We’d love your help. 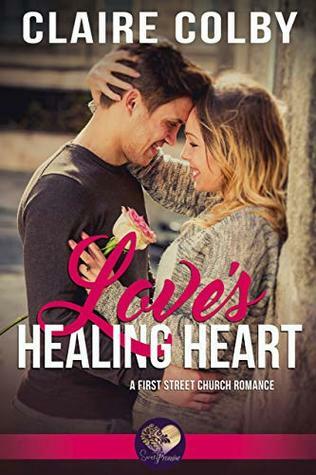 Let us know what’s wrong with this preview of Love's Healing Heart by Claire Colby. Rose Ronson outran her past all the way to Sweet Grove, Texas. The small town offered warmth and safety, and a friendly fireman right down the street in case of an emergency was an added perk. Lloyd Martin knew there was something special about his town's newest resident from his first glance into her guarded green eyes. When Rose asks him to check new alarms she's install Rose Ronson outran her past all the way to Sweet Grove, Texas. The small town offered warmth and safety, and a friendly fireman right down the street in case of an emergency was an added perk. Lloyd Martin knew there was something special about his town's newest resident from his first glance into her guarded green eyes. When Rose asks him to check new alarms she's installed, he readily agrees to help. To ask other readers questions about Love's Healing Heart, please sign up. ”Love’s Healing Heart” is the continuation of “Love’s Healing Home”, with the same sisters, Lily, Rose, and Violet. Book 2 adds a few new characters who bring an added level of suspense, as well as some very touching moments with another sister, Mandy. The unanswered bits from Book 1 are resolved and the ending is satisfying. I received a free advanced copy of this book also, and am voluntarily providing my honest review. It was nice to bring all of the plot lines to a good place and still leave ”Love’s Healing Heart” is the continuation of “Love’s Healing Home”, with the same sisters, Lily, Rose, and Violet. Book 2 adds a few new characters who bring an added level of suspense, as well as some very touching moments with another sister, Mandy. The unanswered bits from Book 1 are resolved and the ending is satisfying. This was a very enjoyable novella length read that I honestly wished was longer. A entertaining and compelling story line and likable characters make for great reading. Some drama and suspense make sure your attention stays focused. Rose and Lloyd's romance was sweet and moving. I would have loved for this to be a longer book. I honestly felt that as good as this short read was, it left a lot of potential untapped because of its shorter length. This is my honest, voluntary review. This second book in this series was just as good as the first one. I liked that Lily's story continued from Love's Healing Home and that this book focused on Rose Ronson and what happened to her in Illinois. Add to all of that the stalker and a cute firefighter and this was quite an emotional story with some surprises at the end. I received an advance copy of this book and I willingly chose to write an honest review. received a free advance review copy of this book and am voluntarily providing my honest review. The “flower” sisters (that's what the neighbors call them) are making a home for themselves even if trouble has followed them to Texas. Rose is trying to face her fears. I enjoyed reading this and recommend it. What could be more scary than having someone stalking you that you have to pack up your life and run away from everything. With the help of her family and other town residents she tries to feel safe and to get her life back on track. This short story is just the right read to steal your heart and root for this family to come out on top. Grab your copy today. This is Rose's story. We first met met her in Loves Healing Home. Rose flees her home in Indiana, to Texas with her sisters when she has a stalker. Will Rose ever feel safe? Can a handsome fireman, Lloyd help her overcome her fear? I enjoyed this sweet and simple love story. Even though I was given a copy of this book by the publisher, it in no way influenced my opinion of this book. Quick, sweet read. Rose has moved to small town Texas with her two sisters after being mugged by an unknown stalker. She is now agoraphobic and extremely afraid of men. Lloyd has made inroads in to helping her heal, then the mugger appears again. I received an ARC. This is an enjoyable novella length read. An entertaining and compelling story line and likable characters. A sweet and clean romance. Will Rose find in Sweet Grove he strength to rebuild her life after The Incident? Will Lloyd help her through the healing process ? A sweet story about second chances. I loved how this book picked up where the last book left off I loved both books and can't wait to read the next one you send my way! This story is much better than the first story in the series. There is more humanity and depth with way less formatting errors.